“We heard Kathy died,” two of the women whispered at our Sunday lunch. Despite the rumors, no one knew for sure what happened. The next day, we called the morgue and verified that an unidentified white female was there, found at the location the women mentioned. “Sure, it doesn’t matter who does the identifying,” the man said. So we went to the morgue and identified her, notified the family, prayed at the funeral home, and comforted her family. Doing acts of mercy for the least of our brothers and sisters is the ministry of Ss Peter & Paul Orthodox Cathedral and Orthodox Detroit Outreach. 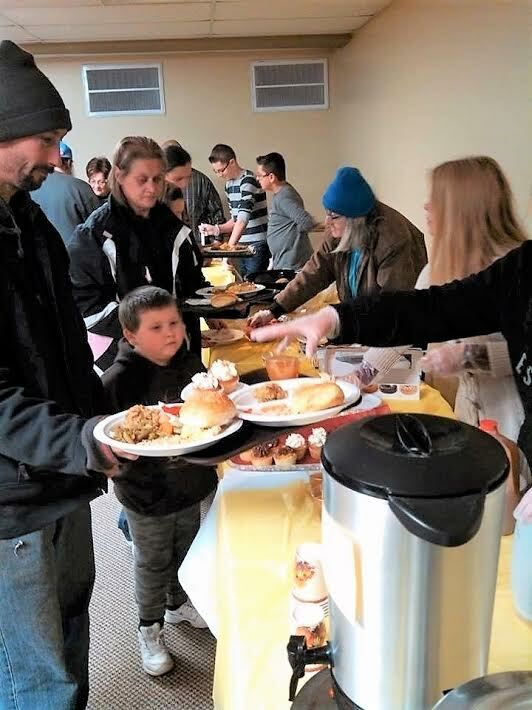 Since 2011, Ss Peter & Paul Orthodox Cathedral (OCA) and Orthodox Detroit Outreach, a 501-3c all volunteer inter-Orthodox organization, committed to “serving Christ through service to the needy in Detroit,” have partnered to develop an amazing synergy. The key word here is synergy, defined as the cooperation of two or more organizations, or other agents, to produce a combined effect greater than the sum of their separate effects. Neither Ss Peter & Paul Cathedral nor Orthodox Detroit Outreach could have built and sustained a five-and-a-half year history of Orthodox Christian service to the poor on their own. Orthodox Detroit Outreach’s mission is to provide a venue for Orthodox Christians to serve. We have been blessed to be able to mobilize the Orthodox faithful, building on a decades-long history of inter-Orthodox cooperation in Detroit. A small leadership team heads up planning and operations. Our goal is simply to love God and our neighbor. We recognize the image of God in every person, and always strive to serve with humility, compassion, patience, and love. We extend the Church beyond the confines of the parish, and bring it to our neighbors in need, coordinating volunteers to feed the hungry, clothe the naked, welcome the stranger, and give everything we have for the benefit of those in need. Our primary activity is a weekly lunch served every Sunday afternoon at the Ss Peter & Paul Community Center. Ss Peter & Paul was founded in 1907 in a typical urban immigrant enclave in Detroit. Most of the Orthodox parishes that were founded during the early part of the 20th century were located in similar neighborhoods throughout the city. In this corner of Detroit alone, there were six Orthodox churches within walking distance of each other. As in most American cities, especially in the rust belt following WWII, urban sprawl and increased prosperity saw the immigrants and their descendants move to the suburbs. Their Orthodox churches followed them. That is, all but two: Ss Peter & Paul (OCA) is still located in the same spot, and the Assumption Greek Orthodox Cathedral, founded in 1910 is still located in downtown Detroit. As Detroit continued to decline in the 50’s to the present, its population went from two million to 600,000, thus devastating the inner-city neighborhoods, and the churches within the city limits as well. Ss Peter & Paul is located in a very diverse and impoverished neighborhood just four miles from downtown, and provides a perfect location to serve “the least of the these,” as drugs, alcoholism, mental illness, prostitution, and crime are prevalent. The church has a large campus - the church building, a former church school building now housing a Head Start school, and a two-story community center with two banquet rooms and a commercial kitchen. This amazing cooperative work could not be accomplished without God’s grace — the synergy of God with His people. All are called to serve with love. The generosity of parishes and the faithful has been nothing less than miraculous. Thousands of meals have been served, hundreds of Orthodox faithful volunteers have been engaged, and hundreds of less fortunate men, women, and children have been loved without reservation. We begin every meal with prayer, and a priest is always present. Every Sunday Ss Peter & Paul’s parish priest is in attendance and very often, the priest from the host parish will also attend. All faithful and clergy have been blessed and humbled by this service to our neighbors. We have brought an Orthodox witness to our neighbors, who express endless gratitude for our service. We believe it is most important to remember, “It’s not about the food, it’s about the people.” Relationships have been built over the years with our neighbors. We know their names. We have grown to know and love them. We have seen babies born and people pass away. We have visited people in jail, prayed at their funerals, taken them to rehab, and helped and counseled them in a myriad of ways. In other words, we have made friends. “The poor” are no longer “the other.” We could not have sustained this Christian work without the support of the Bishops, clergy and people within our sister parishes. We are all one in Christ. Will this activity “revitalize” a declining urban heritage parish that is struggling and below critical mass? Maybe… We are “waiting on the Lord” to fashion the parish into a place that is God pleasing. We are working hard at Ss Peter & Paul with a new vision and paradigm of urban ministry for Christians to serve, providing a venue for people who are called to be missionaries in the city through prayer and service. Share with our readers about your parish’s outreach activities. Contact Donna Karabin, Chairman of the OCA Dept. of Christian Service and Humanitarian Aid at: csha@oca.org. Or Arlene Kallaur, Editor of Parish Ministry Resources at: arlenekallaur@hotmail.com. Janet Damian is a member of Ss Peter & Paul Cathedral (OCA) in Detroit, serving as choir director and outreach coordinator at the parish and is also a member of the leadership team of Orthodox Detroit Outreach.